Remember the HEFTY garbage bag commercial? They taunted the smaller cheaper garbage bags that broke at the first sign of stress as empty bean cans and rotting chicken bones stretched and poked their plastic skins, busting all over the disgusted housewife’s formerly spotless kitchen floor. “wimpy, wimpy, wimpy”, the leaky bags would whimper. ‘HEFTY, HEFTY, HEFTY” , the stronger sturdy bags would chant ; taunting the disgraced and broken wimpy bags…. The fact that we still remember that is proof that Hefty did not engage in wimpy marketing! How about you? Are you engaging in wimpy marketing? We, of all people shouldn’t be doing anything wimpy. Come on –we’re small business owners. Entrepreneurs. Risk takers. We’re the brave of the brave – if we liked “easy” we’d still be rotting away in some cubicle somewhere. But we’re not. We love a good challenge. We thrive on risk. So then WHY in the world do so many of us wimp out when it comes to our marketing??? Why??? You avoid the hard stuff – This is number one because this is the biggest mistake we see tutoring companies make. MARKETING IS NOT EASY – or rather EFFECTIVE marketing– the kind that will bring you more qualified leads, more sales, and higher profits—consistently, is not easy. It takes W-O-R-K. What does that mean exactly? That means you have to do the hard stuff that most of us hate: study, research, and analyze. You follow your competitors – Fear of stepping out of the box and taking risks prevents a lot of tutoring businesses from really shining through and creating that WOW factor they need to stand apart from the crowd. Take a look at what your competitors are doing and do the opposite. Are they playing it safe? Go risky. Are they all doing print? Find a less crowded place to reach your target market. (Yes, that will take some research!). AND, your competitors are most likely making all 7 of these wimpy marketing mistakes- so do you really want to do what they do? You don’t track and measure- These days with the technology we have you can track and measure almost anything. Use landing pages, coupon codes, secret phrases, and special offers to different segments of your market – ANYTHING to determine how a customer found you! If you aren’t tracking and measuring, you’re guessing and making assumptions – and you know what they say about assuming!!! You’re inconsistent- One ad a year does not a marketing strategy make. Neither does one networking group, one sponsorship, or one flyer. Marketing is a process. You can’t win potential customers overnight, you have to court them and woo them. They have to get used to seeing you around – this builds trust…. And SALES! This doesn’t mean you have to spend a lot. Figure out your budget, figure out where and how to reach your target market and create a steady and consistent marketing campaign to reach them. Get creative, mix it up. You copy huge corporations – If it works for Sylvan Learning Center it’s gotta be a good strategy, right? WRONG!!! Well, sorta. It’s probably a great strategy for a huge multi-million national brand like Sylvan, but are you a multi-million dollar company? We doubt it. So what Sylvan does is probably not going to work for you. Sylvan spends hundreds of thousands studying their market, their customers, and their competition and then they decide how, when, and where to advertise. Shouldn’t you do the same? Don’t be a copycat- you can’t cheat or take short cuts here. 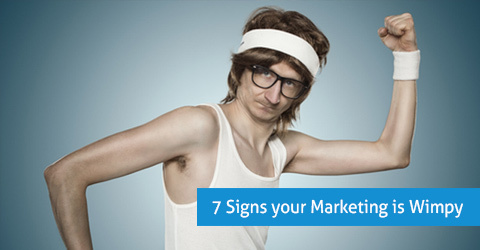 Do your own homework and find out what’s right for your company and your market! Don’t assume Sylvan’s market is your market – it’s not! You give up too soon – There is no magic pill, no magic ad or networking group or tagline or sale that is going to make you an instant millionaire. This stuff takes consistency, persistence, diligence, and repetition. As long as you’re testing, tracking and measuring, keep at it until you get it right and start seeing a good ROI (Return on Investment). If you’re diligent about this part you will get where you want to go – We promise! Ok, so… are you wimpy or are you HEFTY? Let us know! Is your tutoring software Wimpy? Check out the hard working Oases Online tutoring data management system today! Then book a personalized demonstration.